I’m sorry–I have not been precise in my use of language. A theme is not Diane Arbus. A theme is not Hemingway (last Thursday). However, as I noted in my post, Habits of Learning, I best come to a subject through the practitioners who demonstrated a mastery, though Hemingway thought mastery of writing impossible. Last week our theme, though not stated, was the craft of writing, as Hemingway understood it. 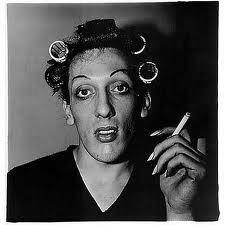 Today we look briefly at Diane Arbus (1923-1971), the ground-braking photographer. (The name is pronounced DEE-ann, by the way.) I’ll let you determine the core theme. 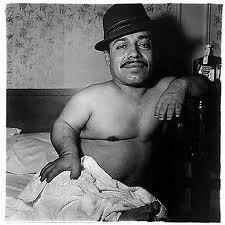 However, as a pioneer Arbus was unsurpassed, and such effort inspires me. * What struck me at the exhibit was not the art on the wall, but the vast collection of journals and letters and notes where Arbus so diligently worked out her ideas. I suggest, as with any visual artist, that you study the work if you want to learn more. You can find more images here. If, like me, you are drawn to the creative life and want to dig deeper, I suggest Patricia Bosworth’s biography, Dian Arbus. 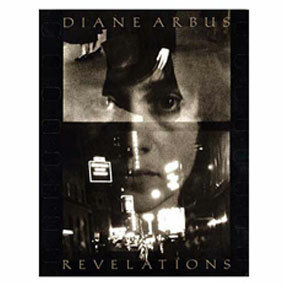 recommend purchasing Diane Arbus, Revelations, the publication encapsulating the Met exhibit. It is a coffee-table sized monograph and narrative that is indispensable to the serious student of the creative examined life. * On inspiration: When you find it attempt to understand it. What inspires you and why? Construct a well of inspiration from which you can drink repeatedly. Lovely phrase, isn’t it? And so close to what we think of when we think of the attributes of great art, classic that way.Thanks for the note.